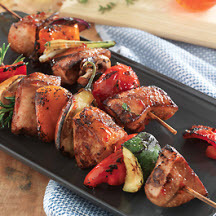 CooksRecipes has quality, kitchen-tested recipes for pork kabobs that you can count on for successful deliciousness. 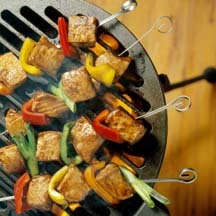 Kabob ingredients don't need to be limited to the vegetables listed, there are several ways to customize kabobs. To make these kabobs more colorful, try a combination of red, yellow and green peppers. 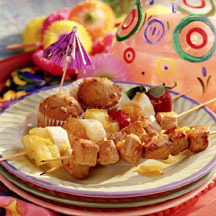 Tantalizing tropical pork kabobs with pineapple, banana chunks and mandarin oranges, basted in a citrus glaze with a hint of cinnamon.